Levi, Kali, Tayton, Tanna, and Blakeli! I was just looking back at some old videos of Tayton where he was breathing horrible and he could barely put together the big Duplo legos. I am just so amazed to see how far he has come. This boy is amazing! I am one proud mom. So here is what we have been up to the past couple of months. 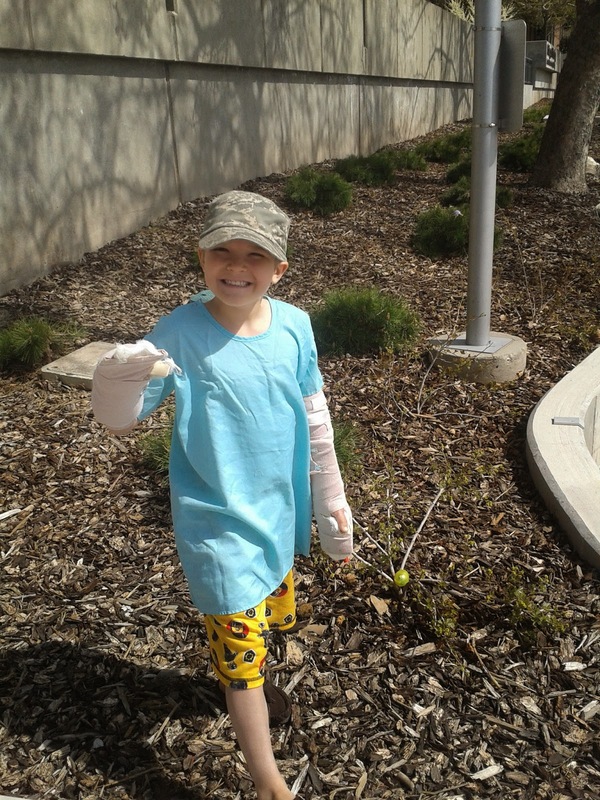 Tayton had his final skin graft surgery on May 5th and it was hard. The donor sights were the most painful part for him. There was a time there where his skin was black and it looked like the skin grafts failed and we would have to do it again. I was heartbroken because I didn't want him to have to go through another surgery. But after three months it finally took and he has been doing so much better then I ever expected. Getting new skin on has helped him so much. He is getting his grip strength back where before he didn't have any. He can bend them so much better. He is happier which makes me happy. For the first time in two years we don't have a surgery scheduled!!! Life is going good right now. 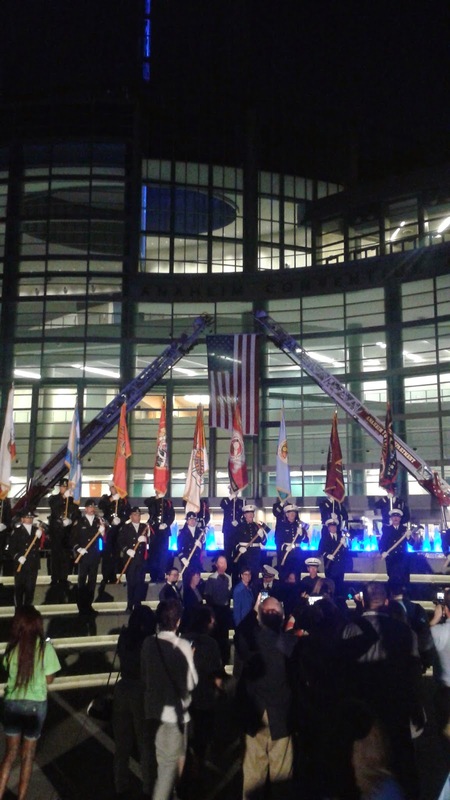 The end of October I got to take Tatyon to World Burn Conference in Anaheim, CA. It was so much fun and we met so many amazing people. 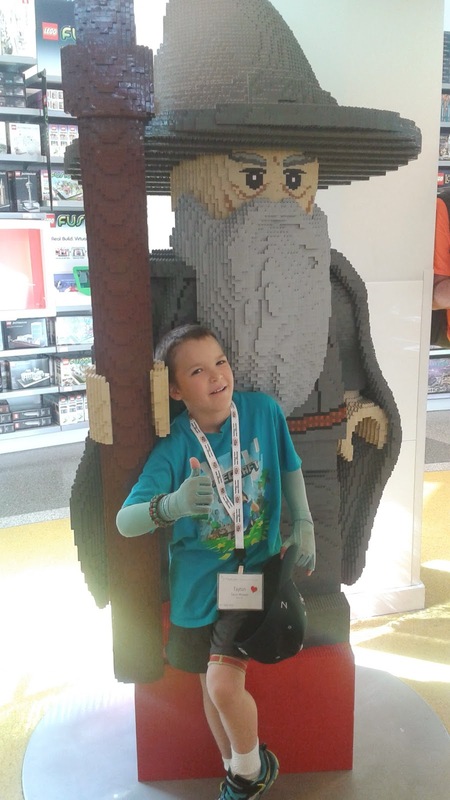 We had some extra time before the conference started so we went to the Lego store! 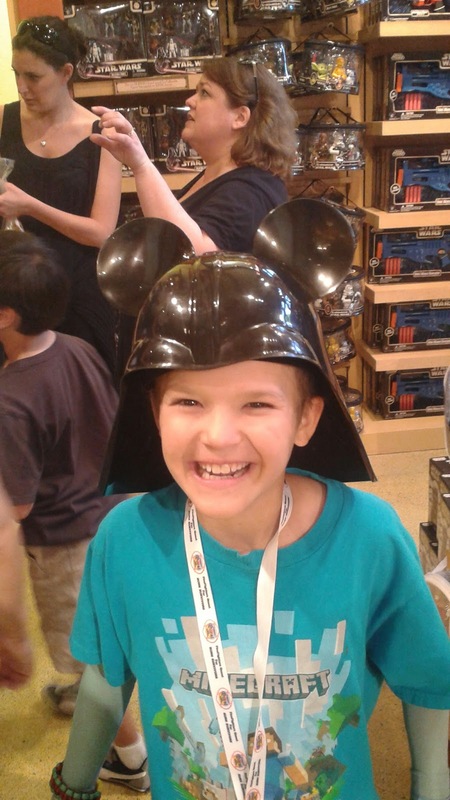 Tried on some fun Darth Vader Mickey hat. Then it was time for the conference, first they had a walk of remembrance for those who did not survive. It was pretty touching. 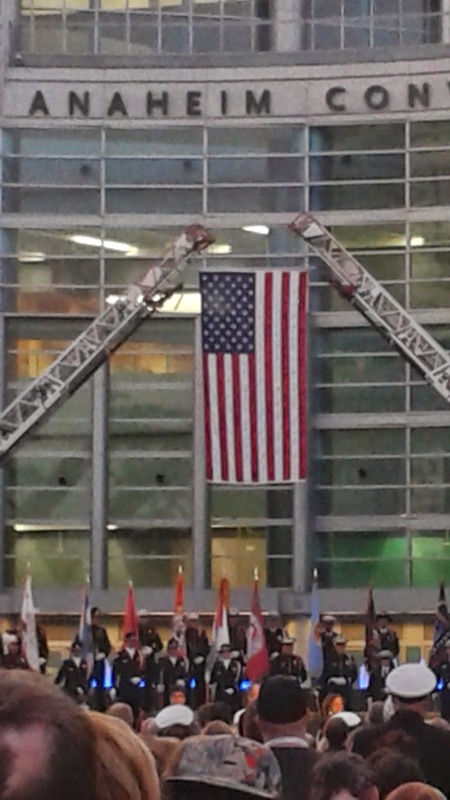 It was neat to see all the firefighters, they had the bagpipes and it was a very touching ceremony. 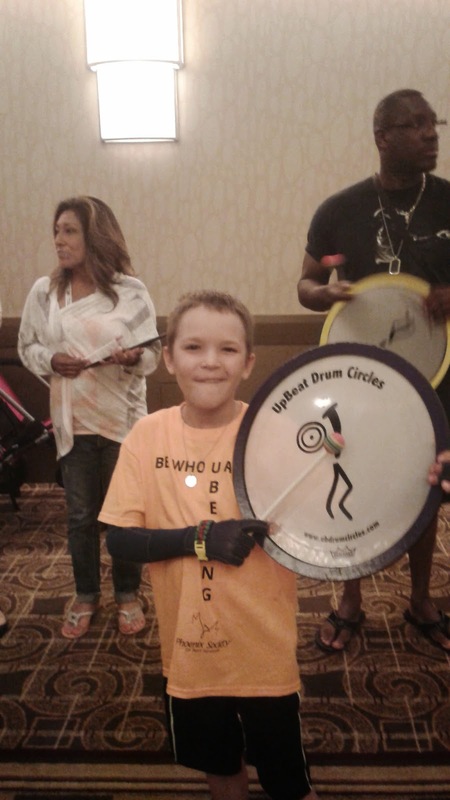 Tayton went to a program called U Belong and he loved every minute of it. 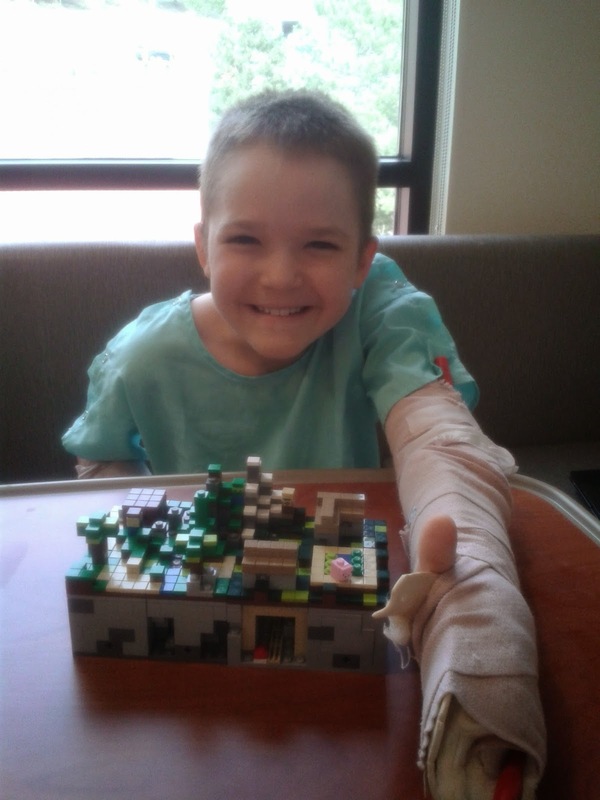 His favorite activity was making a Lego movie. His was called "Evil, Flying, Alien Crocodiles." Sounds awesome I can't wait to see it. He made so many new friends, none live close but we got some contact info for a few and I know we will keep in touch. I went to some really good classes that gave me some amazing advice on what I can do to help him through this and take care of all the other needs of my family. I as so thankful we got to go to this conference. We did get a trip to the beach in. It was so much fun and I am glad I got to go. I love the ocean. I did find myself in a rip tide and didn't do so good in it. I was riding the body board and I wasn't really going anywhere except towards the peer, so I hopped off the board to try to swim better and I heard a voice over the loud speaker telling me to get back on my board and the lifeguard was coming to help me. So the lifeguard helped me get back to shore. Kind of embarrassing but I was happy I didn't know anyone at the beach. Good times. We also got a quick trip to Disneyland in. We went at 4:00pm and stayed until midnight. It was fun but so crowded. It wasn't really the highlight of the trip. I didn't get to many pictures because it was dark and my camera phone doesn't have a flash. Tanna has been wanting an Elsa dress for a long time now, so I waited to give her this because I didn't want her to feel left out that me and Tayton got to go on a trip. I told her this was from Disneyland but really it is from Walmart.com. I just didn't want to pay $60.00 for a dress. She is loving it and so thrilled. I think the timing on it was perfect. Blakeli doesn't really play with toys but she does love candy. So we got her some jellybeans and I think she was super thrilled with that. But I am so happy with how well things are going physically for Tayton. He is doing so great and I feel like I can finally relax. It felt like it was this huge uphill battle, and we are on the downhill. The hardest part is over. I know we will still have more surgeries ahead and other trials but I am enjoying the good times. Happy Birthday Tanna! I can't believe my little girl is 6! So last July Tanna won a one hour princess party in a raffle and her birthday was in June. We debated about having a winter tea party instead of a birthday party, but I am glad we waited, it was so fun and hopefully a birthday party she will never forget. I found all my ideas on pinterest, I am not creative at all, but I think it all turned out so cute. We had Ariels fish friends, and Rapunzels lantern boats. Auroras pink punch, Cinderellas magic wands, and Snow White's poisoned apples. Some of the little princesses would not eat the apples because they really thought they were poisoned. I thought it was funny. I love this little princess and glad she could make it. Blakeli couldn't be left out. She got all dressed up too! Thanks Aunt Shanna for the cute outfit, it was perfect. We played pin the flower on Rapunzels hair. Blakeli wasn't feeling the best so I was running way behind but my sister Christa helped save the day. She helped me get ready and it came down to the final seconds but we did it. I don't know what I would have done without her help. Then Rapunzel came and crowned the birthday girl! All the cute lil princesses. Rapunzel had each princess make their own crown. Then they played this super cute frying pan game. They took turns passing it around then the girl in the middle had to guess who has the frying pan. One tuckered out lil princess. I know we could never afford to get Rapunzel to come to our party but we are so thankful she was able to win it! Sometimes I think Tanna gets left out with everything going on with Tayton, so I was glad I was able to spoil her for her birthday! I love that girl so much, she has so much sass but can be so sweet. She is growing up to fast for me. But Happy Birthday my beautiful Tanna, I hope you made some amazing memories and that you know how much your mom loves you! 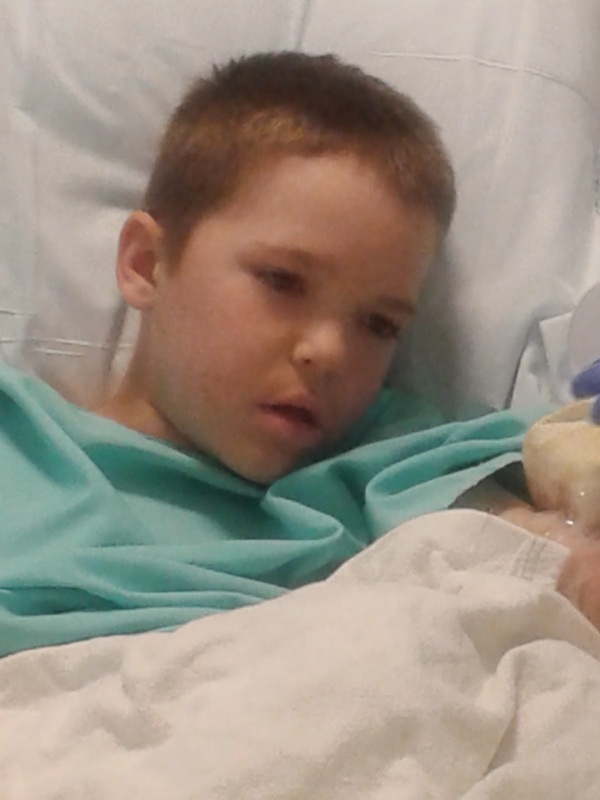 On Tuesday, April 22, Tayton went in for surgery #12. (I am putting the dates so that way when I have to feel out medical forms if I ever need to find dates of surgeries I can look back.) This time they went in, took off the cadaver skin, and put the silicone lining called Integra on. He did really good except coming out of anesthesia. He was having a hard time breathing. They called respiratory therapy up and did some breathing treatments on him. 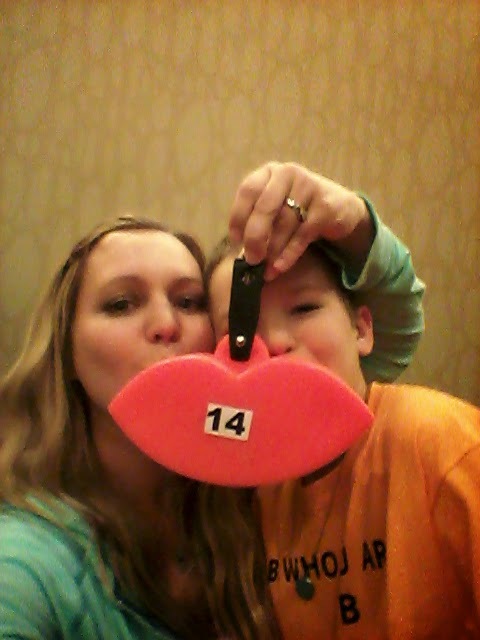 I was thrilled because last week when he had surgery #11 the ENT said his airways was bigger then it has ever been. Well Dr. Morris said the 8 month old baby in the burn unit had a bigger airway. She had a size 4 ventilator tube and Tayton was still at a 3.5. So I was pretty sad knowing that my almost 9 year old son has about a 6 month olds airway. He had to be on oxygen for quite a while and they had the nurses watch him extremely close, but just like he always does, my little guy pulled through. He was pretty tired and slept most of the time for the next two days but he improved and was back to riding his little trike again. Then on Friday it was time to unwrap the bandages and see what his arms look like. So everyone gowns up, and all the bad memories come flooding back. Oh how I hate wound care. Here is his right hand. Looks much better without the cadaver skin on. Here is leftie. Apparently this is as close to perfect as you can get with the Integra. Looks pretty crazy to me. So since it looked so good, Doctor Morris said I would be able to take him home if I promise to give him the medication every 4 hours to his arms and hands, keep his bandages on, and don't let anyone bump his arms. We have to go every three days to change his bandages and tomorrow is our first apt. at the outpatient clinic. 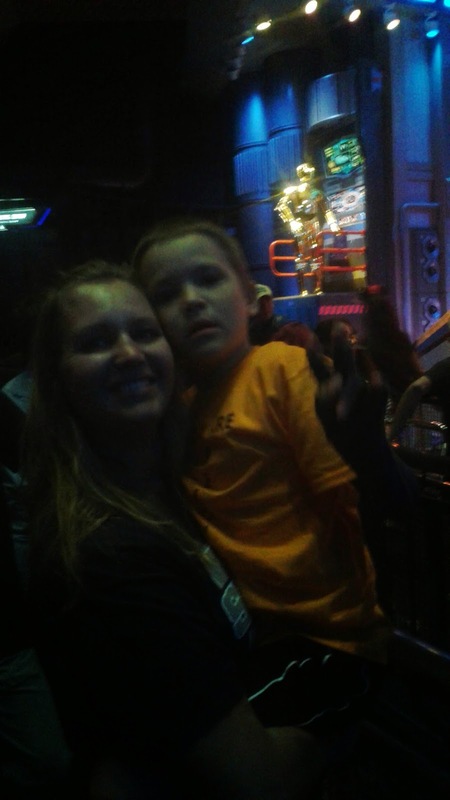 Tayton was thrilled and it was so cute when I told him we were going home. He said "I didn't even know it was something I could cross my fingers for." Originally Dr. Morris told us that we would need to stay in the hospital over an entire month and he wouldn't let us go home because if he does bump it it could ruin the entire surgery and he would have to start over with the cadaver skin surgery. There were talks of maybe letting us go to the Ronald McDonald house for a few days in between but never going home. I am so happy to be home and so is Tayton. It is nice to have everyone together. I love being able to see my girls and sleep next to my husband. I have been really good at the medication, I'm not letting him go anywhere but the hard part is he is so itchy and tries to itch it and it is slowly taking the bandages off. 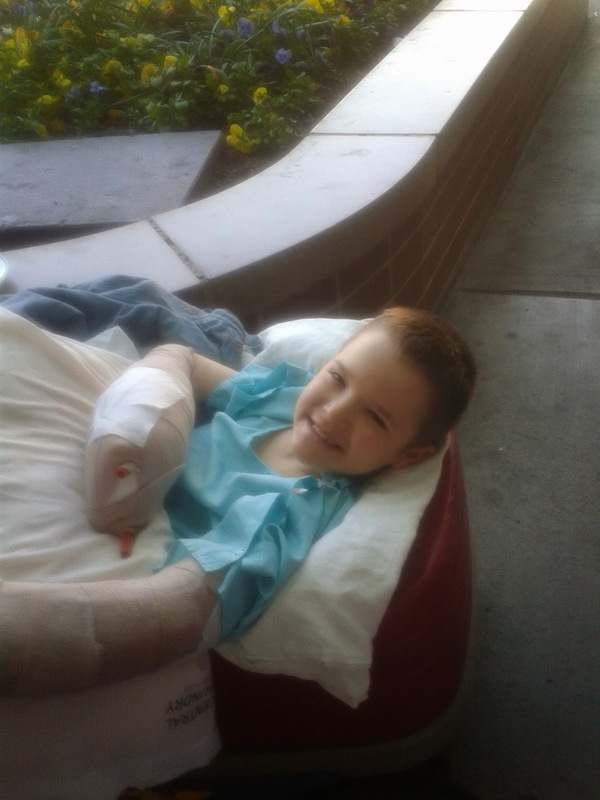 It is always a battle but I think he knows how important it is and he doesn't want to go back and be in the burn unit. His next surgery is May 6th, so if things continue to go good he will be home for his birthday! I am so happy. So after surgery depending on how things go, he will be in the hospital another week or two. 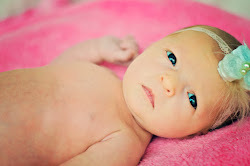 Here are some fun pictures of what we have been doing in the hospital the past week. 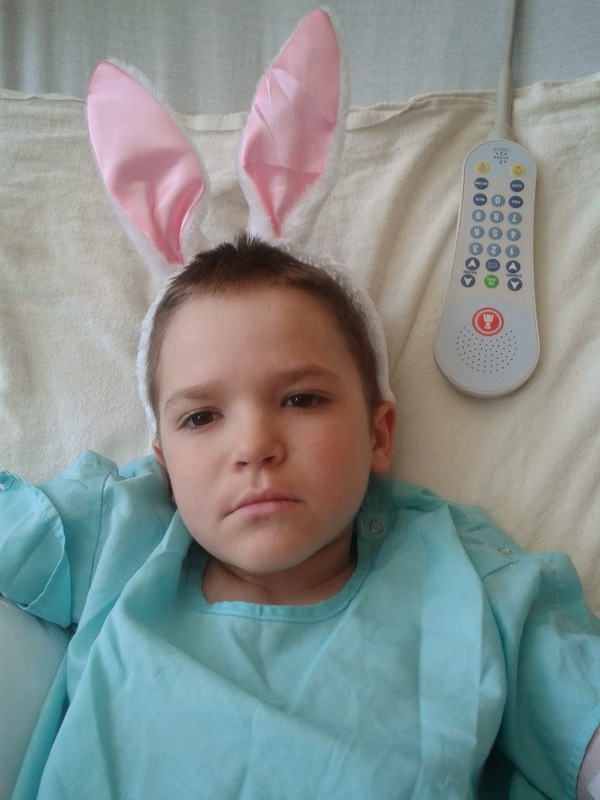 Easter morning, he was thrilled to have the Easter bunny ears on. But when you can't use your hands there is not much you can do about it. 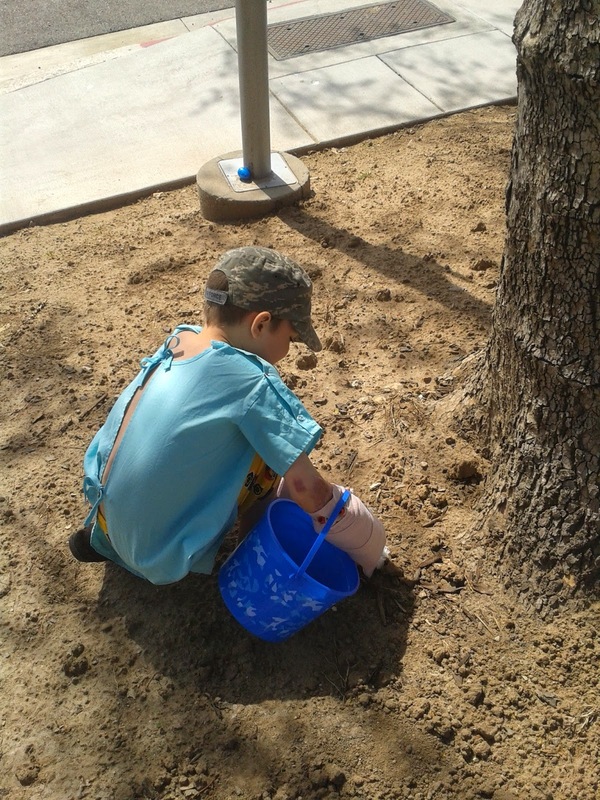 I took him out on the hospital grounds and hid some eggs around for him. Bad idea to put them in the dirt. He tried to pick them up but it didn't work with the huge bandages. So finally he would just point then I would go pick them up and put them in the basket. The hardest part about this surgery, I think, is he is sooooooooooo bored. I brought lots of fun things for him to do but I didn't realize he wouldn't be able to use his hands. You can only watch so much tv/movies. So we had fun putting his Lego sets together. He would find the pieces and move them over to me. He would read the instructions and just tell me where to put them. We made a pretty great team! So overall things are going pretty good. I feel so blessed to be home. It still breaks my heart for all the patients at the burn unit. It is hard to seem them go through it. It brings it all back. But at the same time it makes me appreciative that we aren't back at that stage. He is improving every day and hopefully we can get his skin back on and that surgery will go well. Thanks for all the support. So on Tuesday morning we woke up around 4:45am and headed to the U of U burn center. For some reason that morning I just wanted to pick him up and drive him anywhere except there. I thought I should take him to Las Vegas and we could go on vacation or head to California. I just wanted to be anywhere but there. I was so anxious because I knew this surgery was going to be awful and hard and I had been praying for strength so I could help Tayton get through this. So I took him despite not wanting too. His surgery lasted about 4 hours. The ENT, Dr. Marshall Smith was going to do an airway surgery again, but when he looked in there Taytons airway was the biggest it has ever been!!!!!!! For the first time ever we had a positive outcome with the airway surgery. His airway is still really small, the size of an infants. 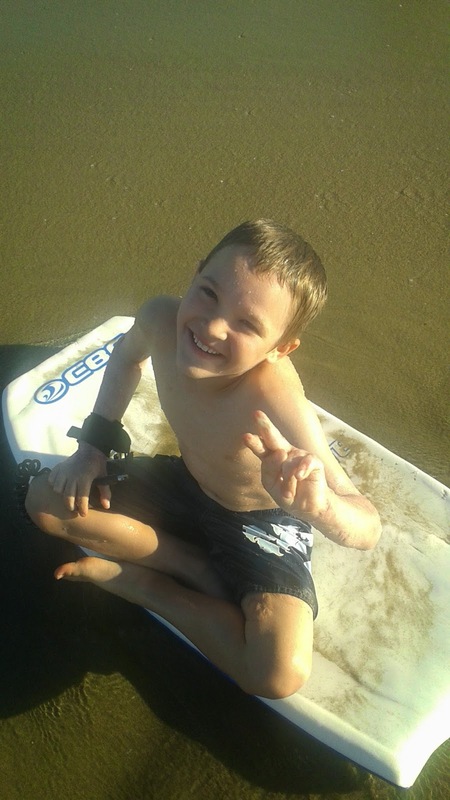 When Tayton was first burned they had a size 6 tube in, his first airway surgery it was like a 2.5 or 3. So his airway was smaller then half the size. The largest we ever got in his airway was a 3.5. Well on Tuesday they got a 4 in and there was a tiny leak. I was thrilled. So Dr. Smith just said I'm not going to work on him I think he is stable for now, but eventually we need to do the post-terrior cricoid graft surgery. It is another major surgery but we can wait a while before we have to do that surgery. The Dr. Morris came out a few hours later and told me Tayton did great. His vitals stayed good the entire time and he handled it great. He cut all of Taytons scar tissues out and put cadaver skin over. The reason why they put cadaver skin on is because of all the infections Tayton has been having. Last week we were in the ER twice draining infections out of his arms. So they were afraid if they put his skin on it wouldn't take and they would just waste it. He was in so much pain that night and was just screaming that it was too much. It was so hard, I wish I could have taken it from him. I felt so helpless. He was on some major pain medication and he couldn't have any more. A few hours later he settled down and was able to have a great nights sleep. Here is is the first day. Here he is on the second day, getting more color. I think here we found a good balance with the pain and sedation medications. Yesterday was actually kind of a fun day. He was able to get out of bed and walk around. Then I took him outside for a picnic lunch. Then we took the wagon to the front doors and waited for Tanna and Blakeli to come visit. It was nice to have everyone together. Then there was this morning. They had to do a deep sedation when they took the bandages off. I am glad because he won't remember what they looked like. I took pictures of his arms and hands but they are too hard for me to look at. I have seen a lot to. 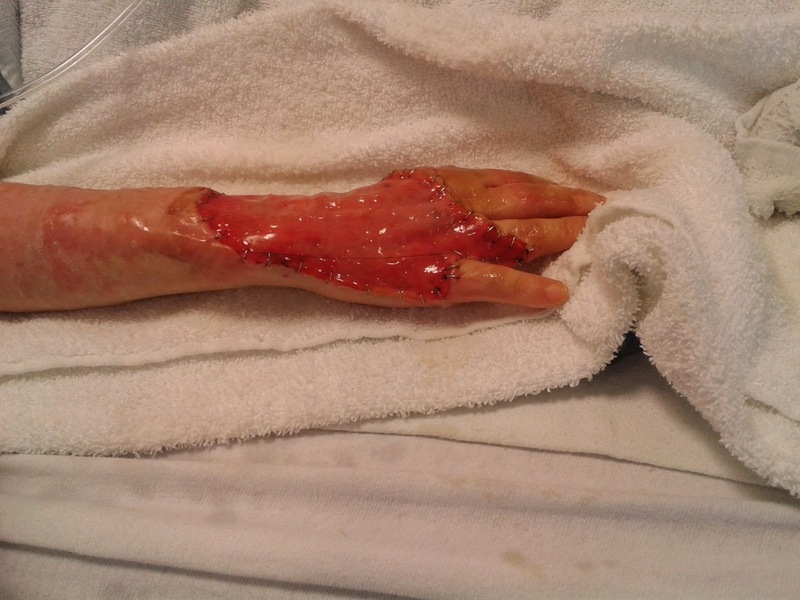 The doctor said they looked exactly how they wanted them to look, nice and pink and the cadaver skin attached to him. Here is my poor boy sedated. He was seeing double at one time. It only lasted about a half hour and then he was feeling so much better. I thought I knew what to expect but because his scars were so deep there were huge holes in his arms. I thought it would be pretty even but it looks like something took a huge bite out of his arms and hands. So he will have his next surgery Mon or Tues. They will go in, remove the cadaver skin and put a silicone lining called integra on. The integra should help with his skin attaching, it should help make it not scar as bad, and should help it not be as tight. It can still get infected so we have to watch for that but things have been better this time around so I am hoping we have no complications. So after the integra is on we have to wait 7 - 10 days then they will finally be able to graft his own skin on then we will stay at the burn unit a few more weeks then we should be able to go home. We will be in the hospital over a month. This time around things have been different. Some things are so much better. I love that this time he can communicate and tell me what the problem is. I love that he isn't as sick. He isn't on a ventilator keeping him alive. He is only recovering from the surgery and not from the burns. I love the new burn unit. The rooms are huge and I love having a window in every room. I love having a shower, bathroom, and bed in his room so I don't have to leave. They have a refrigerator so I don't have to eat every meal eating cafeteria food. The only thing I don't like this time around is seeing him in pain. He doesn't really remember much of the first time around because he was in a coma for most of the painful parts. It is still hard seeing other patients. It brings back so many horrific memories. I try to talk to some of them but then they ask me why I am here. 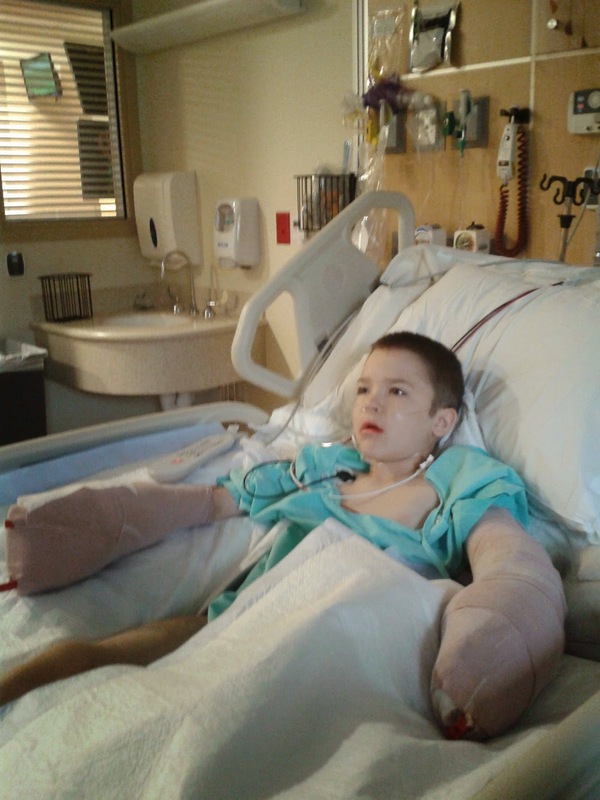 I hate telling them that my son was burned 17 months ago and we are back doing skin grafts. They keep asking me what recovery is like and I hate telling them Taytons story. 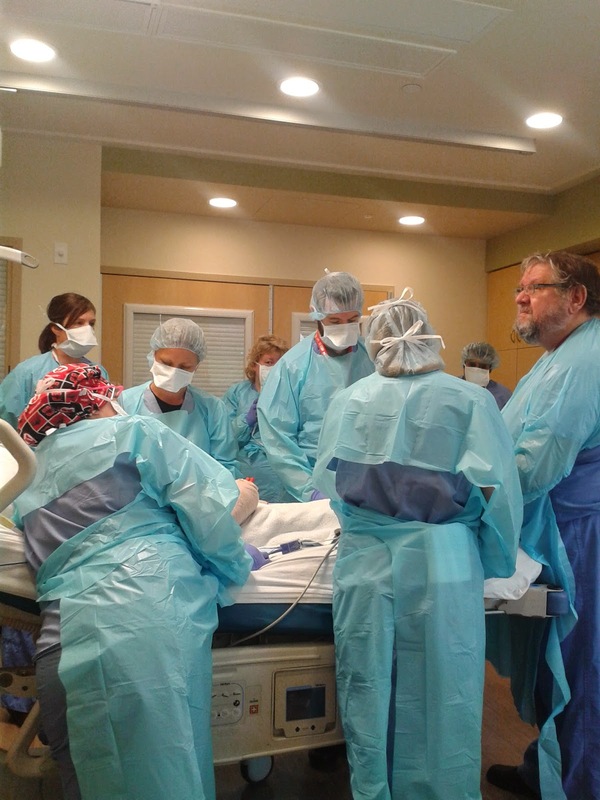 Most burn patients haven't had 11 surgeries in 17 months. Most don't have to go back for the skin grafts to be re done. But at the same time I don't want to lie to them and say things are going to be easy, because with any burn the recovery is long and hard. Also he is so bored. I had a bunch of things for him to do. I had lego sets, coloring books, games, and lots of little toys but he can't use his hands. They are so bandaged up. He can't even feed himself and he isn't even allowed to move a finger. So I found tv and movies are great but I don't want him to watch all day. We read a little and worked on things from his scout book. I really don't know what else I can do with him until he can use his hands. I don't know when I will be home again to blog but I post every day on facebook. Hopefully he will improve each day and each surgery he will get better and better. Can you believe my baby girl is all ready one? That went by so fast. 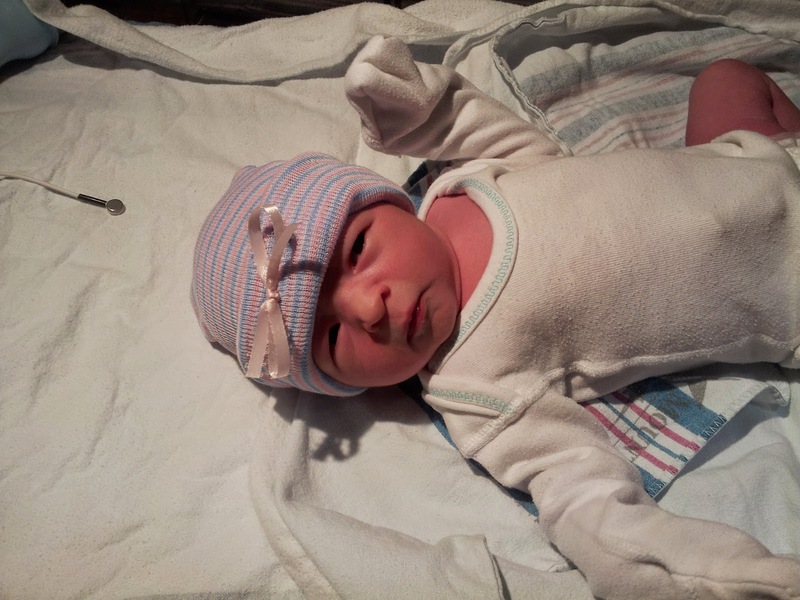 When I went into the hospital to have her I had an emotion breakdown. I knew Tayton was going to be having a surgery a few weeks after I had her and my life was so crazy at the time I didn't know how I was ever going to take care of Tayton and a new baby. I was so worried. But right when I saw her I was so in love! This little girl has brought so much joy and happiness into our lives. She came to our family when we needed her the most. We were in a dark place and she was the light we needed. Every year on my kids 1st birthday I make them their own special cake. They get to dive into it. My cake turned out to be an epic failure from what I had originally planned but I'm ok with it. I don't think Blakeli cared one bit. I was going to have three cakes and one was an O the other N then the last one an E so it spelled ONE. Then I was going to give her the O and everyone else could eat the rest. Well the cake was so crumbly that it just came out in pieces. Then trying to frost it the cake just fell apart. I have seen those pictures on Pinterest where they show what they were trying to do and what actually came out. I wish I had those pictures you would be laughing. As you can tell though she loved the cake! She had no hesitations and she dove right in and ate and ate. Finally she got full and started throwing the cake all over so I gave her a bath. The next morning I even found cake in her ear. So fun! Here she is opening up presents. She got some books, clothes, bath toys, diapers and this fun new Minnie Mouse ride on toy. Thanks grandmas and aunts, she is spoiled. She loves being pushed around on it. This boy always has a way of making us smile. So funny. We had a great time celebrating this girls birthday. I know she could tell that it was a special day for her. I am so blessed to be her mom and I am so happy she is part of our family. I couldn't imagine my life without her in it. Thanks for always making us smile Blakeli Rose. We look forward to many more birthdays ahead! We love being together and being with our three beautiful children. Tayton 8, Tanna 4, and our little Blakeli. We have had some crazy challenges thrown our way but we love our life together. 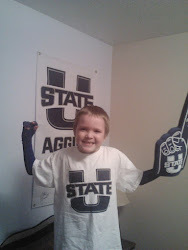 Tayton is our amazing 8 year old that has overcome so much in his short time. 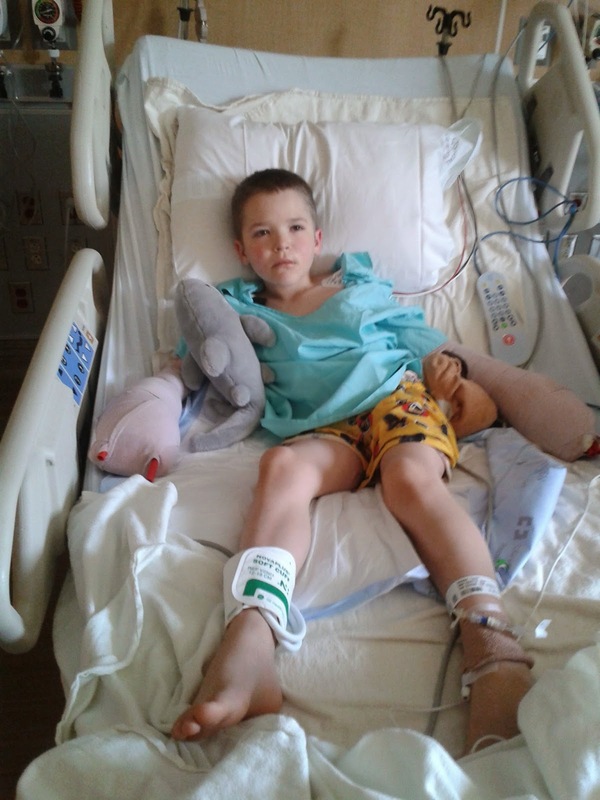 He is a fighter and he continues to amaze us every day. We are so proud of him. He loves playing football, baseball, wrestling, and just being active and we are hoping we can get him doing all those things again. 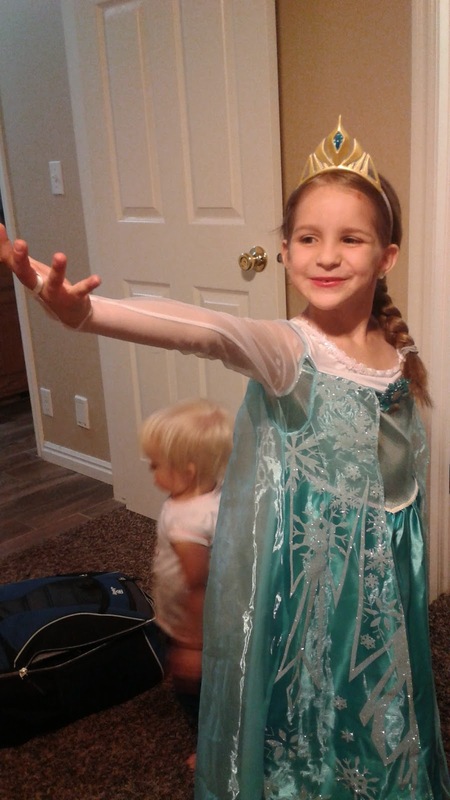 Tanna is our beautiful 5 year old princess who loves life and loves learning. She is such a good helper to her mom and loves barbies, princesses, and playing with her brother and little sister. Blakeli is the sweetest little baby there is. She is so happy and brings such a joy to our family. We wondered what we ever did without her. I been waiting for this for the last 7 years . . .